Here’s my take on this subject. There can be no doubt that the world-wide climate is changing – rapidly and for the worse from a human perspective. The impacts are already being felt, but not in a way that motivates the average American to be concerned. Until and if it does so, there will be insufficient voter support for doing anything meaningful in response. I won’t argue these assertions. They are plain to anyone interested in the facts. 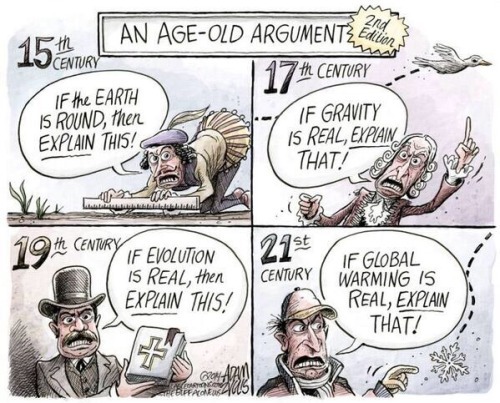 I honestly believe that many climate change skeptics either don’t wish to deal with the problem or are scientific dullards who grasp at any straws to avoid reality. I grant that there is disagreement about the influence of human activity on this coming climate catastrophe, but that isn’t relevant to my point. It is coming, and that is all that we need to know. Now, none of the above is at all remarkable. It is probably the consensus of any competent observers. But there is more. I believe that eventually the impacts will be sufficient to move even a lethargic electorate. They will feel them where it counts, in their pocketbooks. This might happen soon or decades hence. The timing is difficult to predict. Climate requires skill, data and perseverance to understand. But when this does happen, we will come to a very uncomfortable realization. One way or the other, we are facing a substantial reduction in our standard of living. Indeed, this could be similar to regressing a hundred years in time! I say “one way or the other” because we could do nothing and just let it happen, or we could move aggressively and make the best of it. In both cases, however, the reduction will inevitably occur, although managing it affirmatively should lessen the pain. Those who currently advocate immediate action really haven’t grasped the consequences. They rightly see the danger but they haven’t thought through what a response might entail. Their plans, like the Green New Deal, are pie in the sky. It isn’t just the astronomical cost, though that should daunt anyone. It is the consequential change in how we live, work, travel, and amuse ourselves. Read any good history describing life in the early 20th century for a flavor of our future. However, this could be misleading because the intervening years have brought knowledge and progress in many ways that would persist in spite of the changes I predict. For example, we won’t suddenly forget our accumulated medical knowledge, nor will the internet mysteriously disappear. The pace of automation might actually increase. Nevertheless, I suspect that it will be fair to say that our lives will slow markedly and some industries will be curtailed or disappear entirely. Our food supplies and distribution chain will be hurt. That will be far worse in less developed countries, and we are hardly immune from turmoil abroad, as recent history makes abundantly evident. Tracking these impacts so far in advance is very difficult, though their broad scope is certainly amenable to scientific analysis. That is beyond anything I could do, but I do hope that academia turns its attention to this soon so that plans can be formulated for the time when the political will emerges. I take no pleasure in these predictions and I sincerely hope that they are overwrought. But what if I am right? Think about it, and review your own attitude towards climate change. Is another mass extinction looming? No, this has nothing to do with Donald Trump. My topic is the bigger picture. Over the millennia the Earth’s biosphere has endured repeated mass extinctions. Somehow life has survived and recovered, but these events can be catastrophic. It is generally accepted that there have been five major extinctions, each of which became an evolutionary turning point, causing virtual elimination of at least 70% of all living species. Of course, life always finds a way, as the fictional mathematician in the movie Jurassic Park wryly noted. Usually different life forms assumed dominance after each catastrophe, and while evolution stuttered it nevertheless continued. None of these events has happened since our species evolved, but that may be about to change. In fact, on a geophysical time scale, this threat may be imminent. And don’t be so sure that we will be among the survivors. This ominous prediction arises from an analysis of concentrations of oceanic carbon over time. The ocean, in case you didn’t know, typically retains fifty times as much carbon as the atmosphere, and variations in its concentration have correspondingly larger impacts on climate. Results of this study are summarized in the figure below. The use of logarithmic scales in this diagram highlights a key point. The crucial discriminator is not the amount of carbon. Rather it is the rate of change. When carbon concentrations rise or fall very quickly, then this seems to be correlated with the occurrence of mass extinctions. This isn’t a perfect correlation and it certainly doesn’t prove causation. Rather it is a statistically meaningful indicator. Over the time frame covered by this study, there have been 31 oceanic carbon variations that exceed the margin of error, shown by the yellow band. Of these, only 10 were extreme, and the worst 5 of these closely match the major extinction events. In particular, all of the 4 excursions showing sudden increases match such events. Keep that fact in mind. Of course, you might scoff at this correlation as a chance relationship deriving from how the data were analyzed, but there is a plausible scientific explanation for why it could be valid. Describing this requires more time and expertise than be profitably expended in this blog, and only those of you with deep scientific training would understand it anyway. So, let’s just stipulate that the threat may be real. Now comes the good part, using that adjective very loosely. An analysis by geophysics professor Daniel H. Rothman of MIT shows that since 1850 there has been a very significant acceleration in oceanic carbon content. Recent measurements are quite precise and the data can be confidently extrapolated for coming decades. At the predicted rate of change, the world will enter the mass extinction zone in about the year 2100, give or take a decade or so. If you remain skeptical, have a look at this article. Now remember the fact that I highlighted above. 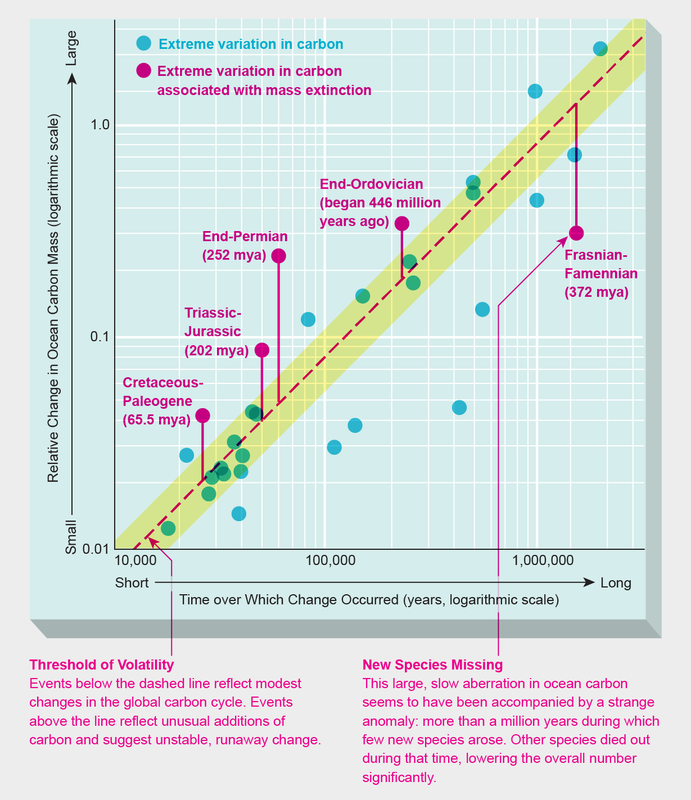 Looking again at the diagram, note that there have been no circumstances going back hundreds of millions of years when a sudden rise in carbon concentration didn’t coincide with biological disaster. None! If another such event is happening now, this will be the first for our species, and thus the first time when an extinction subject might conceivably alter or prevent it. Personally, I suspect we would survive, but the post-extinction world would be very different from what we now know. In case you wondered, the MIT scientists ran out a number of scenarios to see if it is possible to change the threat vector sufficiently to avoid the extinction zone. Only one showed any promise at all. It requires a dramatic change in human activity starting no later than 2020. And even this only barely avoids catastrophe. Want to bet on how likely that is? This is precisely what I believe. The climate is changing, and for the worse from a human perspective. Most of those who deny this do so because they find the consequences of facing reality distasteful. Others are simply scientifically illiterate. There is a somewhat legitimate argument surrounding the degree to which human activity is the driving force for these changes. But that is largely irrelevant to the main point, which is that the most promising and accessible responses have somehow been hijacked by this quixotic attempt to cure the problem simply by reducing carbon emissions. Not that this wouldn’t be helpful, but it is unlikely to be effective for both technical and political reasons. Moreover it diverts attention and resources from more promising solutions. I think this is mostly a consequence of well-meaning amateurs attempting to set scientific policy. So, by all means let’s stop making it worse by spewing more greenhouse gases into the atmosphere. But don’t lose sight of our real goal in the process. We must accept the most likely future, even with our best efforts, and stop pretending that we can somehow halt the consequences of an industrial revolution that has otherwise brought enormous benefits to the human race. It is too late for such wishful thinking. Geophysical changes have enormous inertia. There are estimates that even if we instantly reverted to a pre-industrial world, the climate would inexorably become more threatening before it finally recovered. Some effects are self-propagating. Glacial melt and warming of the vast northern tundra are prime examples. Methane is a far more potent greenhouse gas than carbon dioxide, and the ocean basin and continental tundra are emitting this in steadily increasing quantities. We are at the cusp of real progress in geoengineering and that is where real hope resides. At the same time we must urgently invest vastly greater effort in protecting our resources and population from the most likely outcome. Keep in mind that commercial interests have caused us to cluster on continental fringes world-wide. Many of our great cities lie beside oceans that will rise and be more turbulent as they grow warmer. They are at great risk. It will take a long time and enormous expense to protect or relocate critical infrastructure. Time is of the essence. Check this map. Do you see what Democrats should fear? 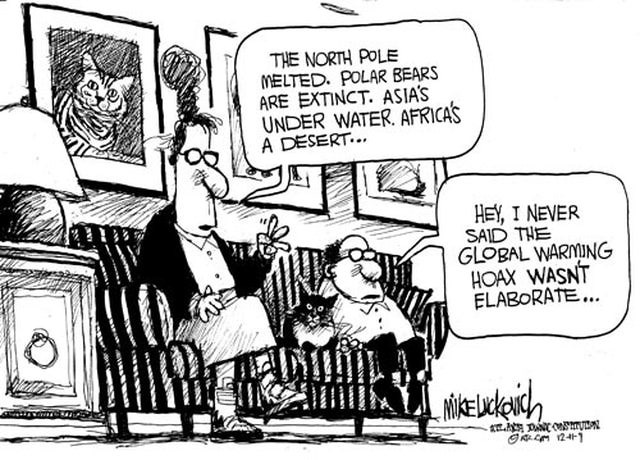 Yes, it is global warming! If ocean levels rise as much as some fear in the coming decades, the most highly populated blue regions will be inundated or washed away. 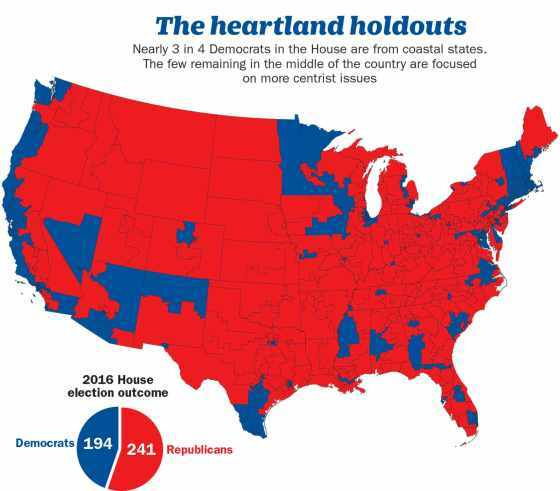 And there are scant few blue districts as it is. As this graphic illustrates, the losses will be from the most progressive areas. I am not implying that this in itself means fewer progressive voters, but we have seen from the last election how much household adversity impacts voting trends. Heretofore reliable Democratic voters abandon their allegiances when vital interests are at stake. Talking about free college and receptive borders won’t hack it with those pushed away from their homes and jobs. Of course there is the possibility that dispersion of progressives into the red interior might change the region’s political character, so take heart those of you on the left! Hippies in Kansas? Ok, I assume you realize that the preceding is satire. However the basis is real and I can’t resist taking this opportunity to comment seriously on this looming threat. I wouldn’t want to leave the impression that I believe Democrats are expressing alarm about global warming because of simple self-interest. All thinking citizens worldwide are justifiably concerned. This threat is real and the scientific consensus is incontrovertible. As a scientist who has actually worked professionally in the fields of meteorology and geophysics, I feel safe in making this assertion. Many conservative doubters, however, have suspicious motives and a weak grasp of and little respect for science. They simply don’t like the consequences of having to face this threat head on. Oh sure, they can no doubt find a few reputable scientists who quibble about the role human activity is playing in global warming. I’ll bet I could find credentialed scientists who think the world began about 6000 years ago and that the Moon landing by Armstrong and Aldrin was a gigantic hoax. Scientists can be as ditzy as anyone else, but consensus rules the day, thank God. Regardless, it really doesn’t matter what is causing this calamity or whether human activity is crucial, unless of course you believe that we can significantly prevent the worst from happening. Personally I doubt that our feeble efforts to mitigate human impacts will make much difference and are likely a waste of time and resources. Rather, we must strive urgently to live with the inevitable impacts and to protect ourselves where possible. It is simply a matter of where we get the best bang for the buck. A good test case is in progress as we attempt to recover from the recent weather disasters in Texas, Florida and the Caribbean. If we simply rebuild and re-establish communities as they were before, we will have failed the test. Posted on September 26, 2017 Categories Political PartiesTags Democratic Party, demographics, global warming1 Comment on Are Democrats Washed Up?